If I had to sum up my “career” in one word, it would be gratitude. I get to write and tell stories all around the country, then come home to be with my family and hang out at the local feed mill complaining about the price of feeder hogs. It’s a good life and I’m lucky to have it.—from Michael Perry’s bio on his website. 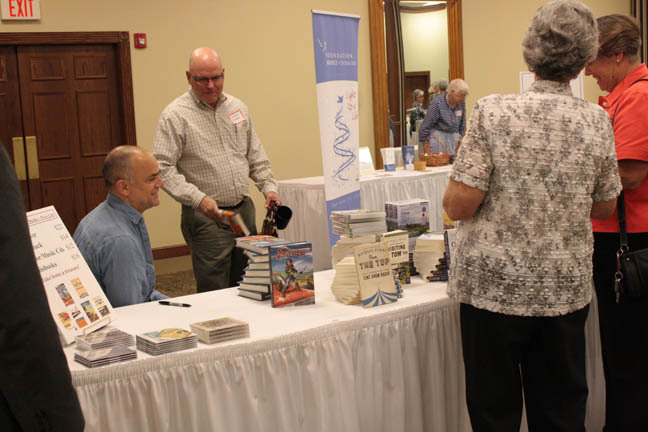 “You have to write something every day, even if it’s junk, to keep those gears turning,” said Perry, now the author of nine trade books, to a group I volunteer with, Hospice of Central Ohio. He was the keynote speaker last Thursday for our annual conference, held in the depressed middling-size Ohio city of Newark. Stubbornness and blind luck, I want to say, but they’re looking for something tangible, so I tell them I discovered the secret years ago while cleaning my father’s calf pens. That is, you just keep shoveling until you’ve got a pile so big, someone has to notice. To tweak the metaphor: while building his own ladder—career as a cottage industry—he kept a signup sheet handy, asking for buyers’ names and addresses everywhere he sold books. His 1991 effort was called How to Hypnotize a Chicken. When that New York agent noticed an article he’d written, his third and fourth self-published books constituted his resume that landed her representation. His mailing list paid off for Population: 485, which got a push by his publisher, Harper, only after its marketing department saw “something happening” in the hinterlands. It was Perry’s humble postcard campaign. Now he compiles both an email and a snail-mail list of book buyers. (And for those who purchase from him CDs of his music, too.) But he still controls the names he collects, as keeper of his own database, even as his publisher now foots the bill for mailings to it. He runs hard, still writes a weekly newspaper column. He told us that even with Harper asking him for books after Population: 485, its editors “rejected the next two.” It was unclear if those were proposals or actual books. Because in 2005, only three years later, he followed up with a collection of essays, Off Main Street: Barnstormers, Prophets, and Gatemouth’s Gator. Our hospice branch probably couldn’t have gotten Perry, except he was on book tour for his latest, a young adult novel called The Scavengers. (His next book is an adult novel called The Jesus Cow, about a Holstein with a Christ-like image on its side.) He was an inspired choice as a speaker for hospice because he’s a nurse by training—he renews his certification every two years, he told us—and because Population: 485 is grounded in his work as a paramedic in his hometown of New Auburn, Wisconsin. His mother is a nurse, and he took EMT training with her and a brother in 1988. He grew up on a small dairy farm, but the mainstream images that conjures get adjusted by specifics. As when he tells us, “I was raised in an obscure fundamentalist Christian sect.” With perfect timing he adds, “I like to tell people that to scare them. It was very gentle.” He’s a farm boy in the way Bruce Springsteen is just a kid from blue-collar New Jersey. Yes, plus . . . He’s a bone-crushingly good writer. 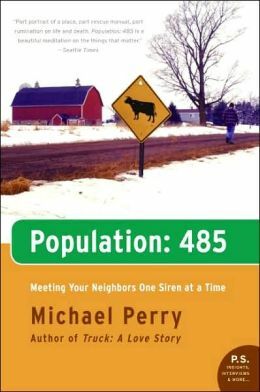 In Population: 485 Perry alludes to the death of a brother and a sister in childhood. He’s very quiet about such matters, though his restrained depiction of a sister-in-law’s tragic death is a centerpiece of the book. You want to say about Perry that he had the wisdom to stay put and mine his material. Except that he’s got a touch of wanderlust—and whatever difference it is that makes someone an artist. The one who chronicles stands somewhat apart. His time away from New Auburn before he returned and joined the fire department is murky. That’s the half-in-shade side of Mike Perry, the aesthete who loves obscure words and who calls poetry “my first love.” Hence the bookish high school football player came back pale, with long hair and soft hands. Growing up, he says, television was banned in his home, but his mother was a voracious reader. He taught himself to read at age four, and in third grade read All Quiet on the Western Front. He also inhaled the western novels of Louis L’Amour. Perry is a compact man, and despite his hardy EMT work and outdoorsy pursuits there’s a physical delicacy and an elfin quality about him. With his expressive dark eyes and ready smile, he exudes warmth. It was easy to picture him as a child in one story he told about himself learning to read. His mother, with her own book from the library, would read a chapter of hers and then read aloud a chapter of his. While she bent over her chapter, little Mike held his book beside her. Sitting quietly and patiently with a story in his hands, he awaited the full revelation of his story’s promise and its mystery. And he began to pick out words. In this image—of a tiny boy in a big chair, legs straight out, holding a book beside his reading mother—literature seems indistinguishable from love. Your reviews flow like a stream of warm milk into a pail, Richard. I love this book also. 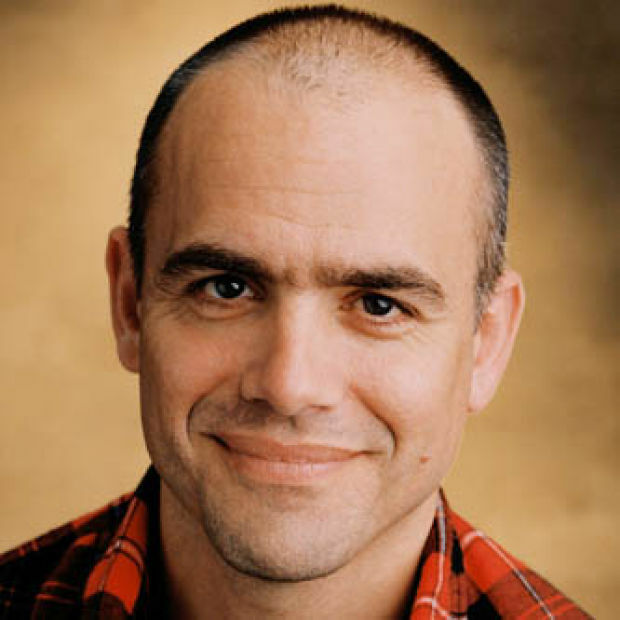 I heard Michael Perry speak at the Calvin College Festival of the Word a few years ago. His career and his writing inspire me, especially since we have so much in common in our backgrounds. I see and share that affinity, Shirley. And what an appropriate writer to have at a Festival of the Word. He’s a true lover of language as well as a popular writer. What a wonderful way to put it, Richard–“literature is indistinguishable from love.” And what a lovely image the words stir. He sounds like a man after your own heart, one with whom you share a number of affinities that go beyond the ephemeral and are part of your writer’s life’s-blood. Thank you for sharing him with us. Thank you for your thoughts, Victoria, and it’s true—I feel a deep affinity for Mike, as a writer and as a person. As I told him, I started volunteering with hospice and visiting the dying for several reasons. I’d been thinking about it for years partly because of appreciation for their help with my mother when she was dying. But I think Mike and his first-responder work were an influence on me as well—kicked me finally into action. I’d just read 485 when I finally signed up for training late last winter-early spring. I’m ordering 485 right now. Thank you, again, for another recommendation. Keep them coming, please. Thanks, Tracy! I hope you enjoy it and predict you will . . .
We’re loving it! We used to live RIGHT THERE– (well, actually, we were 20 miles from New Auburn, which in Wisconsin, is the same as right there); I know the place well. My aunt and uncle still live just a few miles north of there. That’s so great! Pop: 485 is something special. Neat you used to live right there, so can vouch for Perry’s portrait of the region. It definitely is something special. I told Ken he wouldn’t like it (he’s not a fan of “literary” stuff, also not much of a fan of popular–he likes Jane Austin best). But, he likes it. I think Pop: 485 successfully crosses the divide between literary and popular writing. Thanks for the info on Michael Perry. I’ll have to add The Scavengers and maybe Population: 485 to my reading list. By the way, I love how you describe Perry as a “bone-crushingly good writer.” “Bone-crushingly” has got to be one of the best adverbs ever conceived in a writer’s mind. Thanks for reading and commenting, Clay. Glad you liked my phrase—I don’t know where it came from, a mountainous superlative. But, yeah, he’s damn good. Thank YOU, Darrelyn! And I think you will really, really like 485.